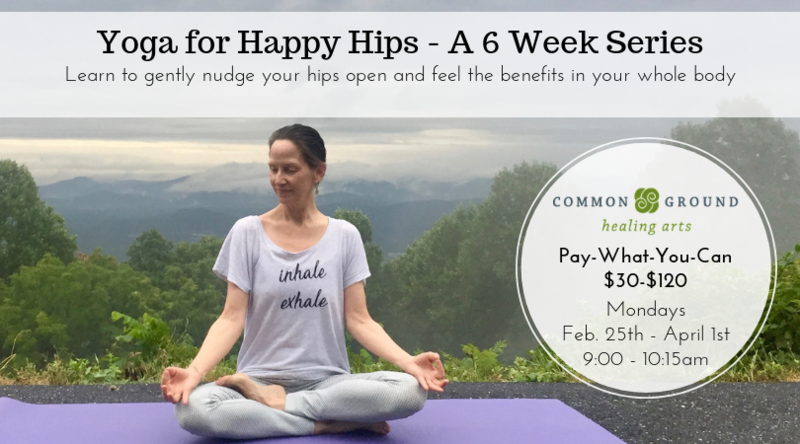 Click here to sign up for Yoga for Happy Hips! The hips are the largest joints in the body and, as such, are a place where a lot of energy is transferred––or stuck. For those who spend a lot of time sitting, or even for those who don’t, the modern world doesn’t give us much opportunity to move our bodies in all the ways they’re designed to move, to keep them healthy. Yoga to the rescue! This class is suitable for anyone who can get up and down from the floor with relative ease. Some yoga experience is helpful but not required. This class is also great for athletes with tight hamstrings/low back, or for anyone recovering from a hip/leg/back injury (not too recent). Your happier hips will thank you! This series is limited to 12 participants to provide for personal attention. This course will be offered on Mondays, 9:00-10:15am from February 25th through April 1st. This series will require a minimum of 4 people to be signed-up. If we haven’t hit the minimum we will contact those already signed up so that we all have chance to recruit a friend or two in the last few days! Mia White: Mia began her Yoga journey over 25 years ago. She was a dancer and loved it but began to feel hollow inside because the emphasis was on outer form, without relating it to inner experience. And so Yoga beckoned, with its promise of connecting the mind, body, and spirit. Ever since, it has been one of Mia’s greatest teachers, an anchor in stormy seas, a compass in times of chaos, a vacation in the mind, a map for navigating life. It greatly informs her everyday life, and her massage therapy practice as well (see www.miawhitemassage.com).